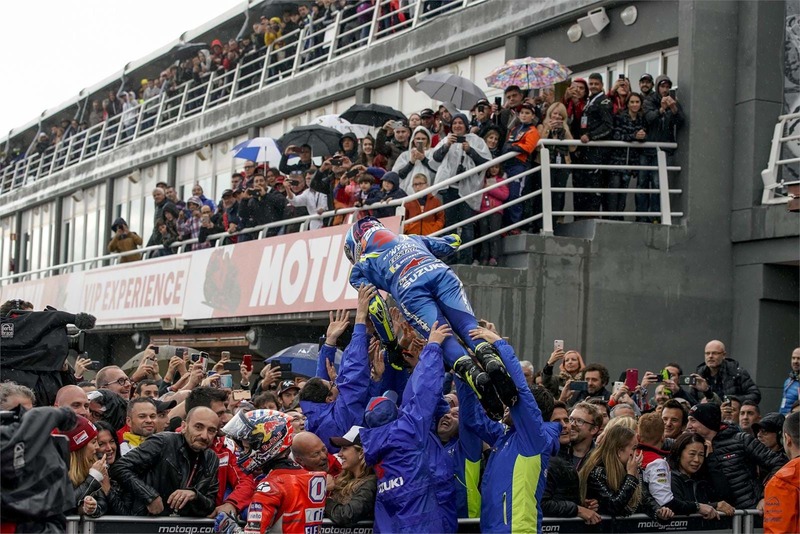 The Ricardo Tormo Circuit in Valencia had plenty of shocks and surprises before the final fireworks marked the close of the 2018 season, with Team SUZUKI ECSTAR securing a ninth podium finish. After a weekend of chilly and wet conditions, the riders knew race day would be tricky. As the lights went out Alex Rins fired to the front from his 2nd place grid spot. The young Spaniard didn’t look back and built on his lead with each sector, setting several ‘fastest laps’. The rain continued to pour down and the attrition rate spiked, making for nerve-wracking times for the now dominant race leader, Rins. On Lap 15 the organisers threw the red flag due to safety concerns. 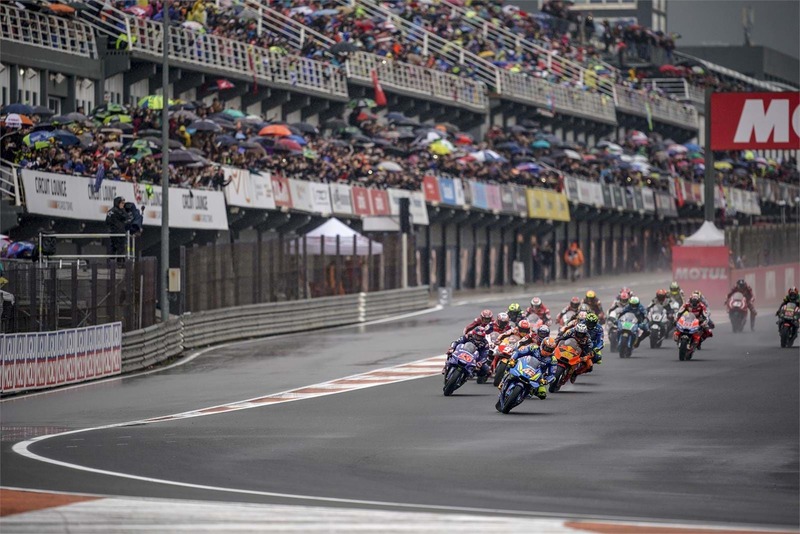 With less than the required three-quarters race distance completed the officials opted for a restart and a secondary 14 lap race after the rain had eased off. The remaining riders lined-up in order of the previous race standings, giving Alex Rins pole. He executed another superb start and took the ‘holeshot’ into the first corner. After a short battle at the front with Dovizioso and Rossi he dropped to third but stayed in contention. Rossi crashed with 4 laps to go, and Alex simply needed to stay on to secure 2nd place. 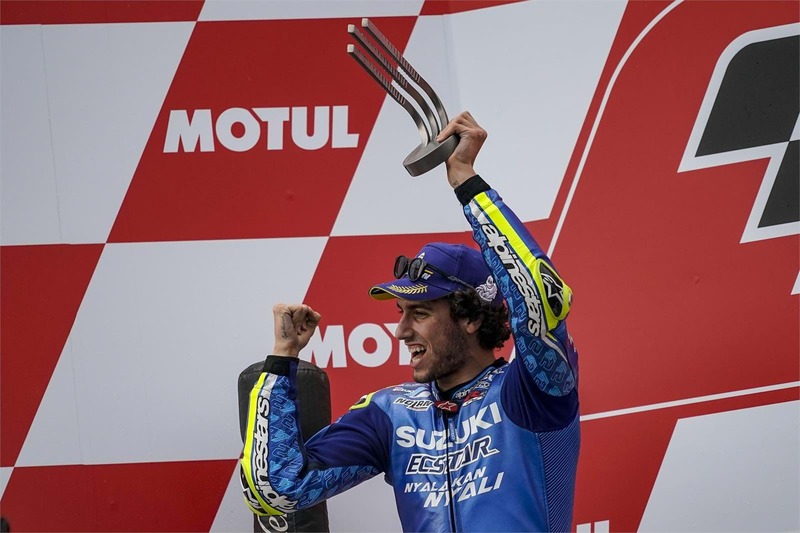 With careful race management and precise riding throughout the day the #42 crossed the line to take his fifth podium of the season, and Team SUZUKI ECSTAR’s ninth visit to the rostrum.